It’s easy to see why so many Americans are so confused about foreign affairs. Their trusted media outlets lie to them over and over again—whether outright or by omission—apparently confident that readers have neither the time nor energy to find more reliable sources of information. Indeed, one must make a significant effort to penetrate the mass media’s curtain of propaganda, which they use to obscure facts incompatible with their chosen narrative. The core of that narrative is always the same: the United States is the indispensable nation, an essentially virtuous nation, committed to making the world a better place for all its inhabitants. Its official enemies, meanwhile, are motivated purely by self-interest; they’ll lie and cheat, and kill, to get what they want. It’s textbook Manichaeism, and it works. 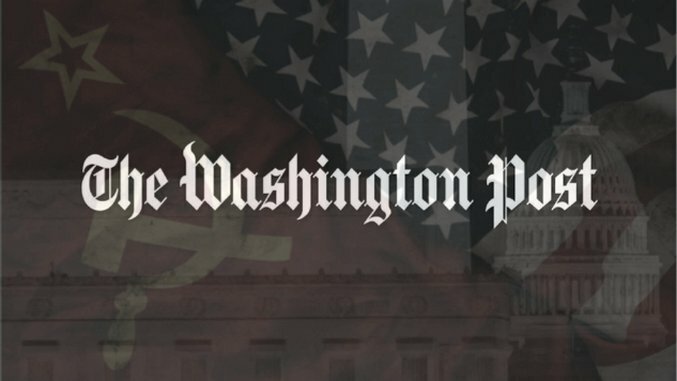 The Washington Post, D.C.’s oldest and most revered newspaper, recently published an editorial on the Syrian ceasefire brokered by the US and Russia. While encouraging in a way, nobody was particularly optimistic about the ceasefire’s chances of success, and there’s a very good reason for this: more than 20 rebel groups rejected it out of hand. Furthermore, Jabhat al-Nusra (al-Qaeda in Syria), one of the strongest and most active opposition forces, was not included in the negotiations, for obvious reasons. As such, it’s only a semi-ceasefire, which is to say nothing of the fact that it depends on the good will of both the Syrian government and the various militant groups that signed onto the deal. The editorial board at the Post did not judge these preliminary facts relevant enough to include in their article. Instead we get an allegation, in the very first sentence, that Bashar al-Assad immediately violated the agreement by “bombing and shelling the very areas the deal is supposed to cover” (as always, there are conflicting reports as to which side is responsible for the breach, something the Post neglects to mention). And get this: Assad intends to “recapture all of Syria by force,” as opposed to, say, letting ISIS and the other jihadist thugs retain control of the territory they’ve conquered by force over the past five years. The man is beyond the pale. But the real thrust of WaPo’s editorial can be surmised without reading a single word. One has merely to glance at the image below the headline—which is of an especially fiendish-looking Vladimir Putin, the evil genius and Soviet revanchist behind everything from the Ukrainian crisis to Donald Trump’s electoral success (he poisons his own cabinet members too, just FYI)—to know that this is yet another Cold War-style hit-piece on Russia. We’re informed that in Syria, Putin is “imposing his will on the United States,” the ceasefire deal giving him “everything he sought.” Such is the pathetic feebleness of the Obama administration, which has even gone so far as to “grant Mr. Putin’s long-standing demand that it join with Russia in targeting groups deemed to be terrorists.” This would include organizations like the aforementioned Jabhat al-Nusra, for instance, who take their ideological cues from Osama bin Laden, and who our regional allies (Saudi Arabia, Turkey, Qatar) continue to support. Per the editorial team over at WaPo, asserting our opposition to these wholesome mutineers is a sign of weakness and thus bad policy. They have concluded, in other words, that maintaining leverage over Moscow takes precedence over combating global jihadism—a decidedly Cold War mentality. On that note, it’s interesting to consider how the word “terrorist” is used, or not used, in the context of Syria. For mainstream media outlets like the Washington Post, there exists a viable “moderate rebel” force that we ought to be shoring up against Assad’s secular government. But “moderate rebel” is rather oxymoronic, isn’t it? After all, it’s difficult to imagine our media referring to the various right-wing militia groups in the United States as “moderate.” We call them extremists. When they use deadly force against the state, we call them terrorists. Who among us is prepared to label Timothy McVeigh, who articulated unequivocally his reasons for doing what he did, a “moderate rebel?” Not me; not you; certainly not the Washington Post. Nevertheless, the prospect of helping Moscow target bloodthirsty jihadists is derided as one of several “sweeping concessions, which essentially abandon Mr. Obama’s onetime goal of freeing Syria from Mr. Assad and make the United States a junior partner of Russia in the Middle East’s most important ongoing conflict.” Conveniently missing from this interpretation are a few relevant facts: (1) the US has no right under international law to intervene in Syria; (2) Russia’s intervention is fundamentally legal, having been requested by Syria’s internationally-recognized government; and (3) “freeing Syria from Mr. Assad,” while nice-sounding, is fatuous in that it says nothing of the illegality or probable consequences of that policy. I wonder why the article’s authors elected to omit that information. An editorial on Syria wouldn’t be complete without reference to “barrel bombs” (a propaganda term that WaPo, to its credit, rightly places in inverted commas) and chlorine gas, with which Assad allegedly attacks his own civilians. WaPo mentions both in passing. Assad’s “surrender-or-starve tactics” (a dramatic way of writing “siege warfare,” a strategy not at all unique to the Syrian government) are also condemned for good measure. Translation: the US should have unilaterally bombed Damascus by now. Indeed, by refusing to do so, we have “betrayed those Syrians who hoped to rid themselves of a blood-drenched dictator.” Never mind that bombing the Syrian government, in addition to constituting a major crime, is utterly insane. Who cares if the resulting vacuum is filled by ISIS, or some equally odious group? Who cares if it would lead to direct military conflict with Russia? Who cares if, between the two of us, there are enough active nuclear warheads to obliterate the planet 20 times over? Uncle Sam doesn’t care and neither should you. ‘Merica. So goes the logic of the Washington Post editorial board, who would evidently like the US government to approach geopolitics as they would a game of Risk. It’s worth noting also that the Post has magnanimously chosen to speak on behalf of the Syrian people, the majority of whom, we’re assured, want “to rid themselves of a blood-drenched dictator”—with the help of the US military, of course. And how grateful the voiceless Syrians must be for this! After all, we in what Hillary Clinton calls the “exceptional nation” know what’s best for the poor benighted souls of the Middle East. Just ask an Iraqi.